There’s been a bit of news before about fake antifa social media accounts, most of which are run by right-wing trolls. Generally they are so clueless about leftist ideology and unconnected to local issues that only other right-wingers have been foolish enough to fall for them. But this “Antifascist Canada” (@AntiFascist_CA) Twitter account is suspicious for different reasons. The account mostly posts “pro-Russian” views, attacking the 2014 Euromaidan protests, Ukrainian government, Ukrainian army, as well as Banderist / fascist / neo-Nazi groups, and US & Canadian government policy in Eastern Europe. Some stuff also glamorizes the Soviet role in World War II. Whoever runs it also obviously knows Russian, as they’ve posted in it a few times in addition to other Eastern European languages including Ukrainian, Bulgarian and Estonian. Other topics it posts about includes Syria, where it regularly compliments supposed Russian military victories, and posts propaganda defaming the White Helmets as terrorists and Bana al-Abed as a fraud, fitting in line with the Russian state’s propaganda (as both make Assad, and by extension Russia look bad). 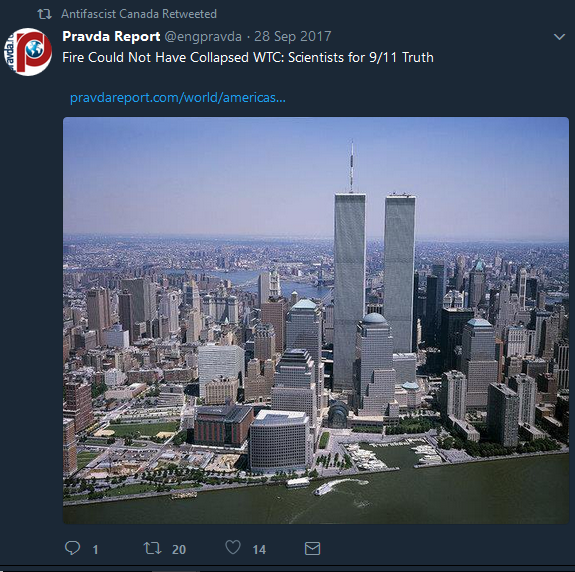 It also posts about conspiracy theories, such as 9/11 truth, JFK assassination theories and more. 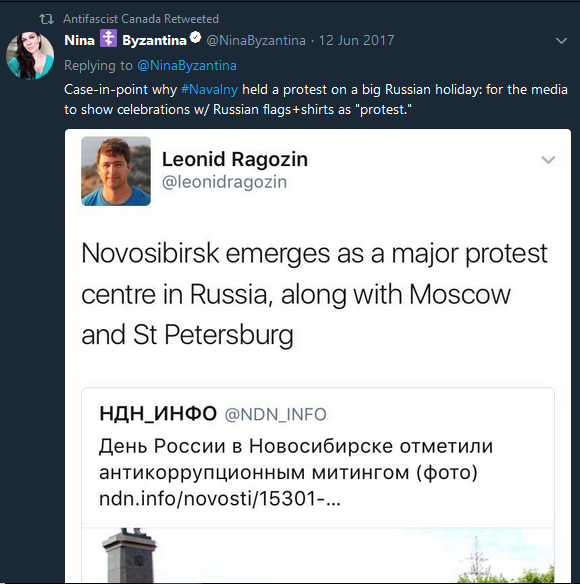 Despite its name, it rarely tweets about far-right activities in Canada or North America, and when it does it’s often from Russian state-operated sources like RT or Sputnik News. For big news like Charlottesville’s Unite the Right it only retweeted a few people snarking about similar torch rallies by Ukrainian fascists. It does however take time to post about statues in Canada devoted to Ukrainian Nazi collaborators, a controversy that while valid, was popularized by Russian diplomats. More tellingly, it’s also retweeted pro-Russian far-right ideologues, namely Alexander Dugin (a complex, highly sensationalized ideologue who has networked with all sorts of fringe actors worldwide) and Nina “Byzantina” Kouprianava, who is Richard Spencer’s soon to be ex-wife. This would be a very strange thing for a supposedly anti-fascist account to do. They also tweeted anti-Semitic articles from Russia Insider, a publication which has increasingly gone in a white nationalist direction. The accounts it follows is also rather suggestive. 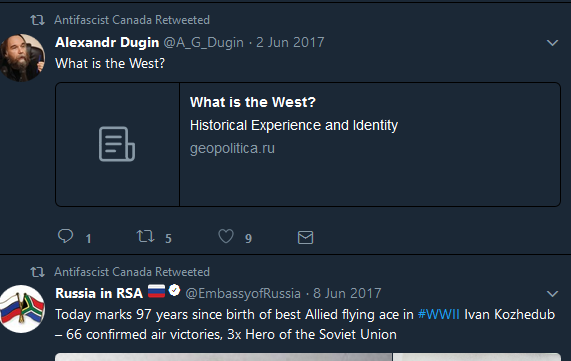 Its earliest accounts are official Russian government accounts, like the Ministry of Defence and the Russian Embassy in Canada, in addition to a bunch of Russian media accounts. It also follows some Russian-Canadian groups, including the Russian Congress of Canada which advocates for policies that would be favourable to the Kremlin. Some mainstream Western news sources are followed, as is China’s Xinhua News Agency and Iran’s Press TV, and non-mainstream sources like the “anti-globalization” conspiracy site GlobalResearch.ca and Stalker Zone writer Ollie Richardson. A few analysts on Russia and Eastern Europe who otherwise look legitimate are followed, as are some who look like hacks. A couple anti-fascist accounts from Britain and America are followed, perhaps to throw us off or were follow-backs, but none from Canada. Even the date the account was created is suspicious, being made in April 2014 just shortly after the Ukrainian conflict began. 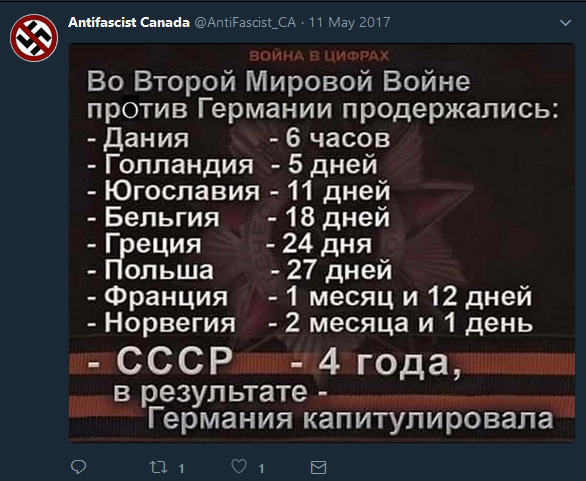 Its earliest tweets were to announce the now-defunct antifascist.ca website, as well as to post videos and pictures of an apparent rally against the “pro-fascist regime in Kiev” held in Toronto on April 27th. 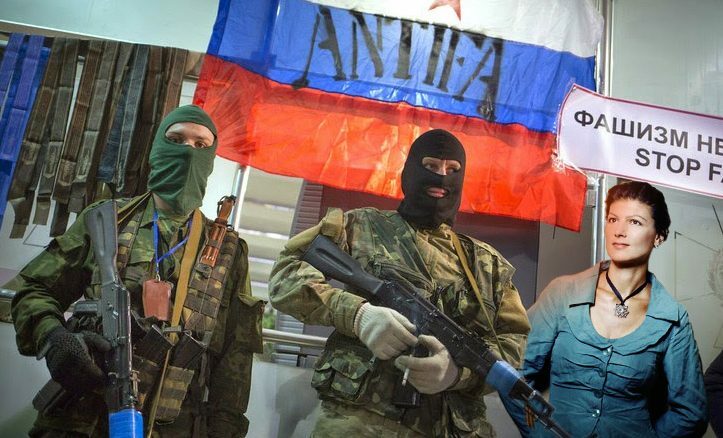 2014 (the rally titled “Canadian Initiative Against Extremism and Ultra-Nationalism” only appears advertised on Russian-language websites, a similar and possibly connected rally evidently happened in March of that year). Although the account has over 2500 tweets as of this writing, only 25 were made in 2014 counting retweets, In 2015 they made 12 original tweets and dozens more retweets, mainly from Russian state sources. Whoever’s behind it started to tweet much more regularly around May 2016. Although despite what you’d think, very little of it is related to the US election. While one can’t know for sure from the users’ end, this is all very fishy and shows the signs of a bad pro-Kremlin influence campaign. So what? Why should you care? This small account only had less than 200 followers after being active on-and-off for over four years. So its reach of influence can be said to be minimal at best. Yet at least a few of its followers are people I know to be legit anti-fascist activists or left-wingers. While I would like to presume it was just an honest mistake on their part and they weren’t paying close attention to it, this can show how easily we can have our movements co-opted and “used” by outside actors who only have their pocketbooks and imperial interests in mind, not the emancipation of all. 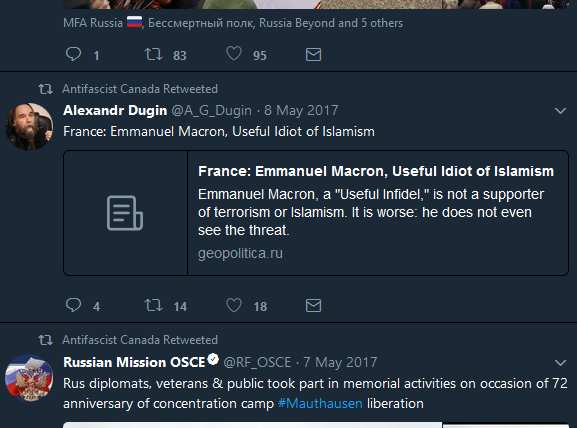 Kremlin attempts to gain a foothold into anti-fascist activism and other leftist movements in so-called Canada are not just limited to the Internet. An important piece on red-brown alliances by “Radical Vagabond” noted that representatives of the Young Communist League, which is close to the Communist Party of Canada, had attended a “World Anti-Fascist Conference” held in Lugansk, alongside many other pro-Soviet communist and far-right Duginist / “neo-Eurasianist” groups. Some leftists are easily duped by their phony anti-fascist and anti-imperialist posturing, as well as their usage of Soviet symbolism. RT also seems to be trying to appeal to anti-fascist audiences. Their “Ruptly” YouTube channel has covered numerous far right & anti-fascist demonstrations in so-called Canada, especially in Ontario. Often their footage is “neutral” with no commentary, but tries to cover the most testy aspects of a demonstration, such as police arrests or fighting between Islamophobes and anti-fascists. People who hate cops will see police brutality, people who hate antifa will see antifa getting owned or being “violent thugs,” and so on. Whether there’s a grand political motive here or if it’s just an attempt to get as many people as possible to subscribe to their Youtube accounts is anyone’s guess. While generally those of more anarchist persuasions should in theory be more immune to Russia’s attempts to “sell” strongman dictators like Bashar al Assad or largely reactionary separatist militias in Ukraine, that doesn’t mean we should not be on the lookout for what can essentially amount as an attempt at entryism. As said before, some leftists find the phony anti-imperialist rhetoric convincing. 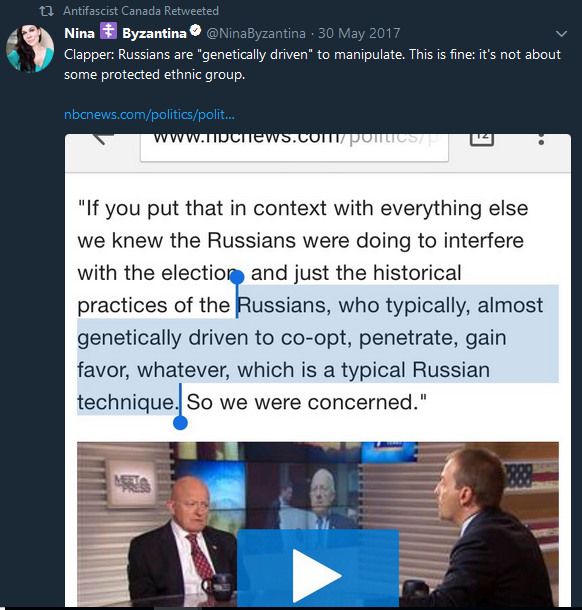 Even if this Twitter account is not the creation of some Kremlin-orchestrated trolling operation, and is just from some very misguided leftist there may still be some lessons we can draw from it. “Confusionist” tendencies within the Canadian left are not entirely new. Will Offley had documented them nearly two decades ago, through anti-Semitic outlets like Arthur Topham’s Radical Press. It is beyond this author’s scope and experiences to figure out how we can best avoid attempts to co-opt our own movements for another state’s agenda, and I do not mean to fall into liberal Russophobic scaremongering (which can downplay and give cover for domestic racism). And at some level there probably isn’t much that can be done to stop them from tweeting or recording. But one good suggestion that has been given is that we can link up movements internationally in such a way that will make the Kremlin afraid of going near us. In that case there has been several good examples in Ontario already. The demonstration in front of the Russian consulate in Toronto showing solidarity with the Russian anarchists and anti-fascists in the Network case is a great example. The Hamilton anarchists who opposed RT “journalist” Eva Bartlett may also be a worthy example. And although I do not know any examples of it being done in Canada, things like International Day of Solidarity of Anti-Fascist Prisoners are also something that can easily be replicated in your own town with small numbers. That way you can support a cause you believe in and simultaneously help your allies on the other side of the globe, ticking off fascists and their ilk worldwide. Movements outside of the anti-fascism can find similar ways of doing this. Click here to download a zip archive of @Antifascist_CA’s tweets in various formats, in case the account is deleted or suspended.